The Institute on Taxation and Economic Policy offers a state-by-state comparison of the tax burden by income group. 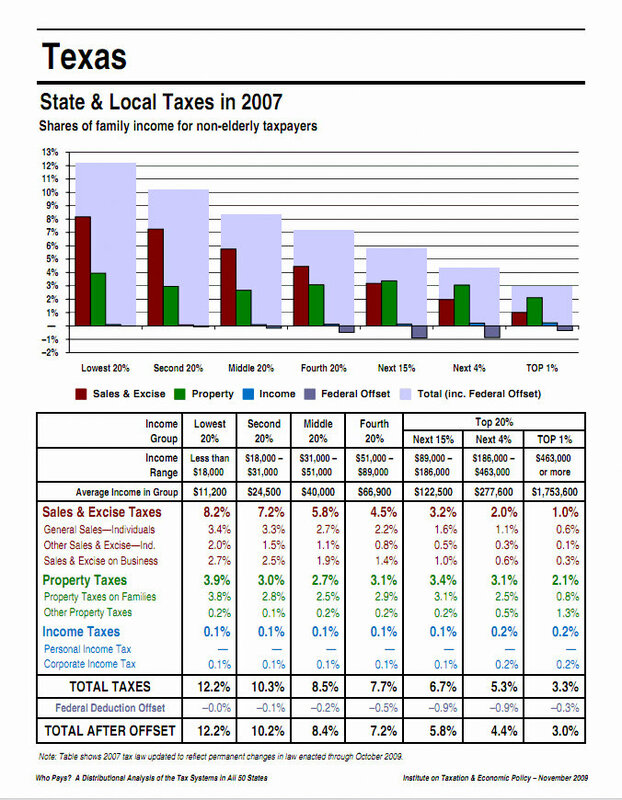 It probably comes as no surprise to you to learn that Rick Perry’s Texas has one of the most regressive tax structures of any state. 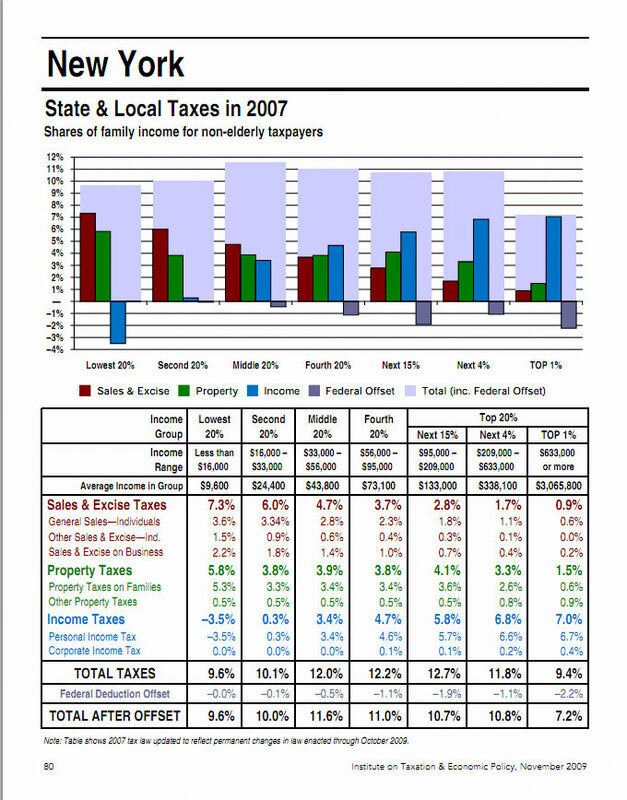 The poorest Texas families with average incomes of $11,200 per year pay more than 12% of their family income in state and local taxes while the top 1% with incomes averaging nearly $1 3/4 million per year cough up just 3%. Middle-income Texans don’t come out much better than the poor. They pay an average 8.4% of their income to Texas governments. That’s tax fairness, Perry style. See the chart for Texas below. How does Perry’s Texas compare to other states? Take a look at the calculations for New York in the second chart below. The poorest New Yorkers are tapped for 9.6% of their income, a little less than other income groups in New York pay. Of course even in New York, which has one of the most progressive tax structures, the richest 1% get a break but it is nothing like the one Perry's rich Texas friends and donors get. 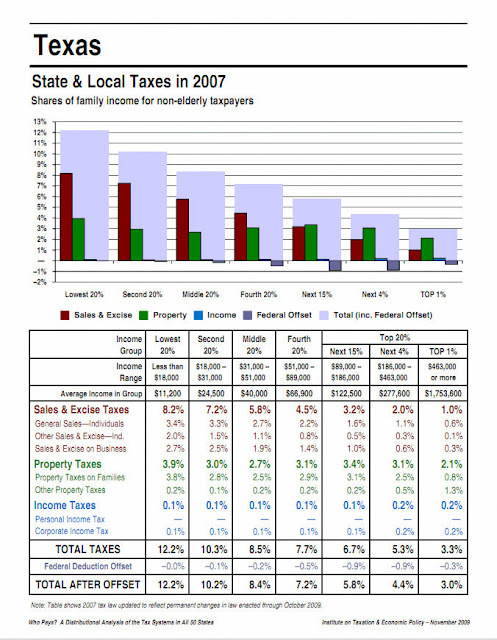 So, Governor “Goodhair” is this the kind of tax policy you plan to bring to the entire country? Wouldn’t be surprised, not in a Texas minute. Check out how your state compares to Texas, New York and other states here: http://www.itepnet.org/ Just click on your state.